The Family Holiday Travel Budget is a great way to save money on your holiday travel plans this year. 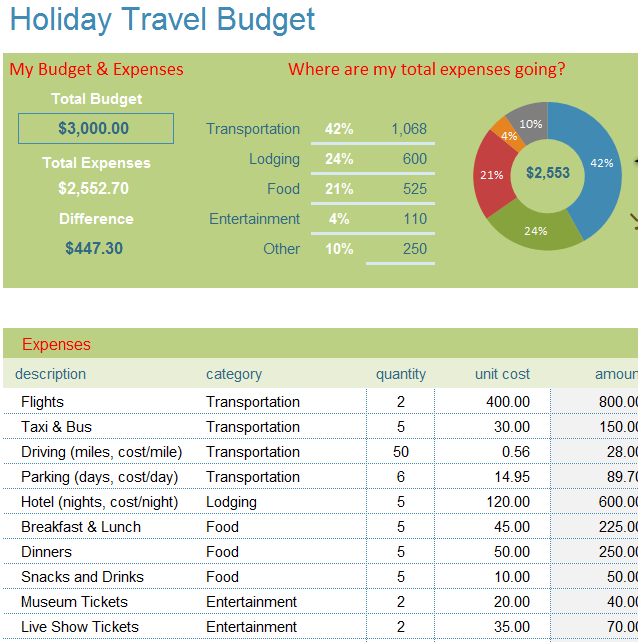 This template takes all the busy-work out of your holiday expenses and gives you accurate data you can use to make the best of your unique financial situation. The goal of this document is to provide you with the tools necessary to make your holiday spending manageable. The best part about this budget is that it’s absolutely free! All you need to do is download the file and then enter all the information that the template requires. In exchange, the Holiday Travel Budget will give you useful calculations you can analyze to make the most out of your holiday season! Simply click the linked provided below to download the document and get started! The most important step in using this document is to figure out the amount you want to list as your budget. Thoroughly think it over, so you can have both a comfortable and affordable vacation this year. This number will go in the “Total Budget” section at the top of your page. Everything else in this first table will be calculated for you, so there is no need to fill anything else out here. The next step is to make you way down to the “Expenses” table. The Travel Budget provides you with a good number of examples in this section, however, you can change any of these to items to fit your travels needs. Simply click in the cell you want to change and start typing your new information. The drop-down menus in the “category” section will help you separate these individual categories for your finances later on. The Travel Budget also gives you a space to enter the quantity of your particular item. If you are traveling with a family of five, then simply enter “5” under the “Quantity” column for your tickets. You will also list the “Unit Cost” next to that “Quantity”. The budget will take all these figures and calculate your totals automatically. These totals will be displayed in both the “Amount” column to the right as well as the overview table at the top of your screen. In addition, the overview section will also provide you with a breakdown of your travel expenses based on the categories you entered. By organizing your budget beforehand, you can have more time and money to relax with your family over the holidays. Create your own travel budget this year with this simple template!